In the front garden there’s a very small and rather underwhelming evergreen shrub. It’s less than a foot high, has dark glossy leaves with pointed tips and for much of the time, doesn’t really do anything. It’s hidden away for a lot of the year and only really becomes visible in the winter when the plants around it have died back. 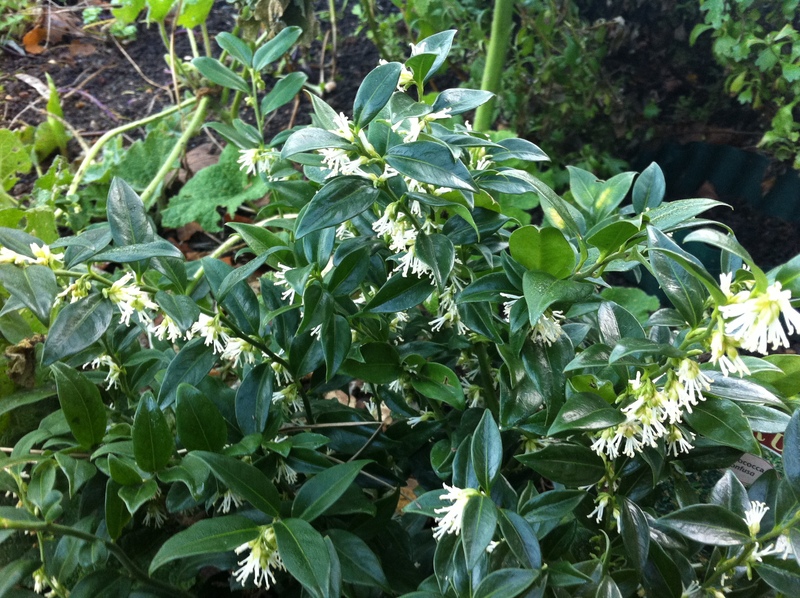 It’s called Sarcococca Confusa and has common names of “Sweet Box” or “Christmas Box“, because it looks a bit like box. I bought it in the summer (on the cheap), planted it and subsequently ignored it. I did notice that it had recently started flowering, but like the shrub itself, the flowers are also not really anything to paint pictures for. They’re OK, and it’s nice that they flower in the winter when everything else is sleeping but they just don’t grab your attention. However, what does grab your attention and make you stop in your tracks to sniff the air isn’t obvious from the picture – it’s the incredible heady sweet fragrance that these tiny flowers are pumping out. This perfume factory is only small, yet I (with my really bad sense of smell) managed to smell it from a few metres away on a cold morning when I wasn’t even looking out for it. It is such a gorgeous perfume that I sometimes just sniff around in the air trying to find drifting pockets of fragrance. It’s just what you need while rushing from the front door to the car to get off to work in the mornings. I shall definitely be trying to propagate this plant. The flowers produce shiny black berries that contain a seed each. I’ve read that the seed will readily germinate so I’m going to collect and sow as many as I can and dot this shrub around the garden. Just imagine how amazing several of these shrubs together would smell. Depending on how generous I’m feeling, I’m likely to give some away to friends and family once the seedlings have grown into well-established plants. The tip is to keep them moist and keep them in the shade, away from strong harsh sunlight. I did this by having hollyhocks growing over the top of it in the summer. This tiny little shrub has become one of the stars in the garden and I can’t wait to have more of them.